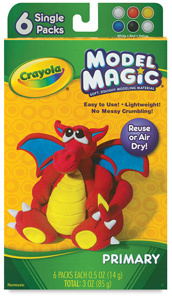 Crayola Model Magic is fun and safe for all ages. It's extremely lightweight and soft, and it air dries in 24 hours without needing firing or baking. Once dry, Model Magic can be carved or sanded. Paint it with tempera, watercolor, acrylic, enamel, or markers. Model Magic is non-greasy. It doesn't stick to or stain skin or most types of clothing, and it doesn't flake or crumble, making clean-up easy. Just 4 oz (113 g) of Crayola Model Magic is equivalent to 1 lb (454 g) of traditional air dry clay, making it a terrific value! Assorted Naturals — A 2 lb bucket containing four 8 oz (227 g) pouches of modeling compound: Bisque, Earth Tone, Terra Cotta, and White. 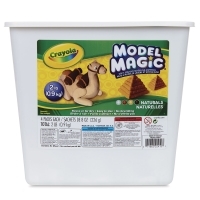 Assorted Colors — A 2 lb bucket containing four 8 oz (227 g) pouches of modeling compound: Blue, Red, Yellow, and White. Assorted Neon — A 2 lb bucket containing four 8 oz (227 g) pouches of modeling compound: Laser Lemon, Radical Red, Shocking Pink, and Yellow Green. Bucket of White — A 2 lb bucket containing four 8 oz (227 g) pouches of White. 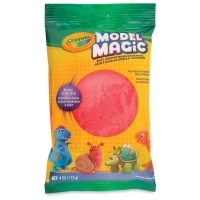 Classpack, 75 Packages Assorted — Contains 1 oz packages of Model Magic. The Classpack includes 21 packages of White, and 18 packages each of Blue, Red, and Yellow. 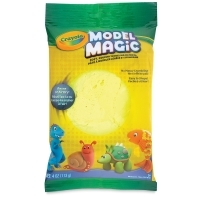 Value Pack — Crayola's Model Magic Value Pack contains twelve 8 oz (227 g) pouches of white modeling compound. These "freshness pouches" can be stored away and used as needed. Value Packs are great for teaching several classes, and for larger projects. 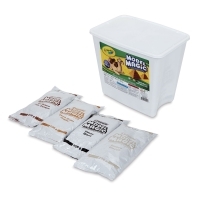 Classpack, 75 Packages White — Includes 75 individual 1 oz packages of White Model Magic. Assorted Primaries — This set includes four 0.5 oz blocks in Primary Red, Blue, Black, and Yellow, plus two 0.5 oz blocks of White. Gooey Fun! Turn you normal slime into Butter Slime. 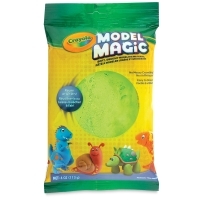 Add Crayola Model Magic to your usual slime receipe for new colors, textures, and fun!